Greg McMillan and Stan Weiner bring their wits and more than 80 years of process control experience to bear on your questions, comments and problems. Write to them at controltalk@putman.net. Follow McMillan's Control Talk Blog. See more Control Talk articles. Stan: A measurement is only as good as its calibration. The pH electrode has by far the greatest sensitivity and rangeability of any measurement in the process industry. The electrode can function well in a wide spectrum of process fluids and operating conditions. Here we look how to make sure the electrode can realize its full potential (pun intended). Greg: To help us, we draw upon the expertise Jim Gray who has decades of experience in electrochemical measurements. I have known Jim personally for the last 10 years and always appreciated and enjoyed our conversations. Jim tells it the way it is (very frank and open). Jim was among the four interviewees for the Control Talk Column Series “The Secret Life of pH Electrodes” that started in Feb 2009, marking the 100th anniversary of the invention of the pH glass electrode. Stan: The plants today are asked to do more with less staff. Technicians are really pressed to do more than what may be realistically possible. Is this affecting the quality of pH calibration? Jim: Definitely. One of the biggest problems I see is the technician not waiting to see the total response of the electrode. A big part of this is the lack of recognition of how slow the electrode response can be particularly in reaching its final value. There are three aspects that create a longer than expected response time. One is the desire to see a response within 1 millivolt (mv) of the final value. For a slope of 59 mv per pH unit and a 6 pH change moving between 4 and 10 pH buffers, 1 mv corresponds to seeing 99.7% of the final response (full response). Secondly, the pH electrode has a protracted response where the response rate of change slows down more than the theoretical first order response as the pH approaches its final value. A healthy electrode will take 8 or more time constants to be within 1 millivolt of the final response. Finally, glass electrode designs, aging or coatings can increase the response time by one or more orders of magnitude. Suppliers may not be particularly cognizant of the detrimental effects of a slow electrode. A new spherical glass bulb can have a full response time of just 3 seconds while the norm is around 30 seconds. However, one manufacturer not realizing the consequences is proud to offer an electrode with a full response time of 108 seconds. Rugged glass electrodes of various formulations have a full response time that ranges from 180 to 315 seconds. Greg: I have seen data that the full response time of conventional glass electrodes can be greater than 6000 seconds due to premature aging of the glass due to high temperature exposure or process fluid coating. Even if the electrode was accurate there is a deception where the slower response time means the electrode is acting like a huge signal filter. If the electrode lag becomes the largest time constant in the loop, the PID gain can be increased. If the electrode lag is larger than the ultimate period of the loop (e.g., larger than 4 dead times), any oscillation will be attenuated. Both of these effects give the illusion of better control whereas the opposite is true. For a static mixer the least expensive and fastest equipment for doing pH control, the process time constants is less than a second and the process dead time is only about 4 seconds for a well-designed system. This means a full response time greater than 8 seconds will enable a larger PID gain and a full response time greater than 32 seconds will attenuate oscillations. Of course, you can hope for a poorly designed injection system where the process dead time increases to over 60 seconds. The Dec 2, 2014 Control Talk Blog “Measurement Attenuation and Deception” explains the problem of a slow measurement in considerable detail. Here we find out the problem is more extensive than realized because it affects the accuracy of the measurement as well. Stan: How are technicians dealing with the problem of a slow electrode? Jim: The concern is that people being pressed for time don’t wait till the pH has stopped changing. As soon as the pH gets close they may use that value for calibration. This can cause more harm than good. Smart transmitters can tell you when the pH has stopped changing (e.g. less than a 0.02 pH change in 10 seconds), but this feature may not be available or fully used. If the adjustment is premature, there will be a significant negative error in the slope. For example the slope error is about 10% (-5 millivolt per pH) if the pH value is 15 millivolts short of each full response for 4 and 7 pH buffer solutions. To adjust the slope, two buffer solutions must be used. To verify the slope and offset adjustments are correct, the electrode should be inserted in the opposite buffer at least one more time. Buffers should be kept in closed containers in a cool place and not used after the expiration date or reused. For example, if fresh 4 and 10 pH buffers are used the pH electrode would be rinsed and inserted in the 4 pH buffer and an offset adjustment made. The electrode would then be rinsed and inserted in a 10 pH buffer and a slope adjustment made. These adjustments are only made when the full response is seen. 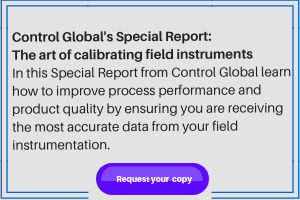 The Auto Cal routine of a smart transmitter will automatically detect when the response is complete and will turn-off solution temperature compensation. The electrode is finally rinsed and reinserted into the 4 pH buffer to see how close the pH is to the buffer value. For this check the solution temperature compensation must be manually turned off. Greg: The slope adjustment, termed a span adjustment in other measurements, is more important for pH because the slope changes with electrode age, chemical attacks and dehydration. An accurate change in sensor is more important for pH than other measurements. An accurate indication of pH change is critical when the violation of environmental limits or in the case of biological processes the health of cells is at stake. In biological reactors and many chemical reactions, the setpoint is on a relatively flat portion of the titration curve. An error in the slope can introduce a huge change in the process gain observed. Stan: What happens as pH electrodes age? Jim: As an electrode ages, the resistance of the measurement electrode increases and the number of active sites near the surface decreases. An increase in resistance makes the electrode response slower. We can use the simplistic analogy of a resistance capacitance (RC) filter to understand the change in filter time. As the number of active sites for developing the potential in response to hydrogen ion concentration decreases, the change in potential with pH and hence the slope decreases. High temperature and chemical attack can cause premature aging. Greg: What really happens at the surface of the glass electrode is complex but one view I got from the book by R.G. Bates Determination of pH – Theory and Practice that I consider the best resource on the electrochemistry of the electrode is that the response depends upon hydrogen ions jumping from hydronium ions in the process to hydronium ions on the glass surface. Consequently, electrodes that lose their hydrated outer layer due to sitting dry or being exposed to high acid concentrations or low water concentrations can have a much slower response. Additionally an imperceptible coating as thin a few millimeters can have a huge impact. Electrodes must be gently rinsed. If the coating does not come off with a water rinse, the electrode may need to soak in an appropriate cleaning solution that does not attack the glass. Stirring may help reduce the soak time. An electrode that has been exposed to cleaning solution or has been dehydrated should be soaked for at least 30 minutes in a 7 pH buffer solution before calibration to reestablish the reference electrode equilibrium and restore the hydrated outer layer of the glass electrode. Stan: What about the effect of temperature on the calibration? Jim: The internals of the pH sensor including the temperature sensor can take 20 minutes to reach equilibrium with the solution. Therefore buffers solutions should be at the same temperature. The solution pH also changes with temperature. The buffer pH value should be corrected for temperature. Some smart transmitters can due this automatically for standard buffer solutions. These transmitters will also turn off any process solution pH compensation. Greg: In high ionic strength processes, we have seen where a liquid reference junction will take nearly an hour and a solid reference junction take nearly a day to equilibrate. Some users have claimed more accurate calibrations by the use of calibration solutions with a similar ionic strength to that in the process. What about the reference electrode response? Jim: Given that we have a healthy, clean, and hydrated pH electrode, a pH reading that keeps changing after 20 minutes is indicative of a reference electrode that has not come to equilibrium. The reference electrode can be a real wild card. For difficult process fluids, the electrode may need to be conditioned by immersion in a 7 pH buffer solution before calibration similar to what is done for hydration. A flowing junction reference is really needed to make the response of the reference electrode fast and the reference potential constant for high (e.g. high salt concentration processes) and very low ionic strength (e.g., condensate and boiler feedwater) fluids. While a flowing reference provides a more accurate measurement and calibration, maintenance balks at the more complex installation and need to refill and sometimes pressurize the reference solution. Greg: One analyzer specialist complained the flow of reference solution into the beaker affected the pH reading of the calibration solution. This is hard to imagine but might be possible for a small container, long exposure, a high junction flow rate, and a calibration solution that was not a buffer. Stan: Any other common problems? Jim: Users have sometimes not inserted the pH sensor in a solution deep enough to cover the solution ground resulting in a bad measurement, which lead to a number of futile attempts at calibration. For a high temperature glass electrode, the solution ground is two inches above the tip. The calibration can still proceed if the solution ground terminal is jumpered to the reference electrode terminal or if a little more buffer is used. Stan: Any final words of wisdom? Jim: Be careful and patient! Greg: I finish with the firm conviction based on 44 years of experience that middle signal selection of three electrodes ideally of different durations of process exposure should be used for all pH control loops. This setup offers inherent protection against a single failure of any type and reduces unnecessary maintenance by the online detection of a deteriorating electrode based on the recognition that its pH response is lagging, shorter or exhibits a consistent offset when compared to the middle value. The middle signal selection also improves accuracy and reduces the noise of the pH used for control. The life cycle cost can be significantly reduced besides the control being more precise and reliable. The only exception I know of is where the pH electrode life is so short due to extremely nasty process conditions that an automatic retractable electrode assembly must be used to reduce process exposure time and provide online conditioning. We conclude with the "Top 10 New Year’s Resolutions I expect to Break"
"Top 10 New Year’s Resolutions I expect to Break"
(10) Use less integral action while eating. (8) Try out model predictive control to lose weight. (7) Improve threshold sensitivity to my spouse’s feelings. (5) Eliminate deadband when I need to change direction. (4) Get a real plant to behave as well as a virtual plant. (3) Reduce dead time in Congress. (2) Develop neural network model to replace budgetary process and improve economy. (1) Redesign Congress to prevent the negative relative gains in congressional interactions that created hidden loops and reversed the sign of control action needed. Postscript: We are looking for new people to feature in this column. This is your chance to have your voice heard and share what you have learned for the benefit of the profession. The process is simple, easy and causal. You just talk by phone with Greg McMillan for an hour or two. There is no formal list of questions and answers. The conversation is free to go wherever is of most interest to you. You get to review the draft and edit as much as you want of the conversation. If you are interested, please contact Nancy Bartels, the managing editor of Control magazine.